Last night, I finally got around to combining two dishes that I knew would taste great together, a la Reese’s Peanut Butter Cups: Citrus Quinoa and Mojo Shrimp. The Citrus Quinoa recipe, from Coastal Living, was designed to go with a snapper entrée. The Mojo Shrimp recipe is actually a Mojo Chicken recipe that seemed like it would work for shrimp, too. 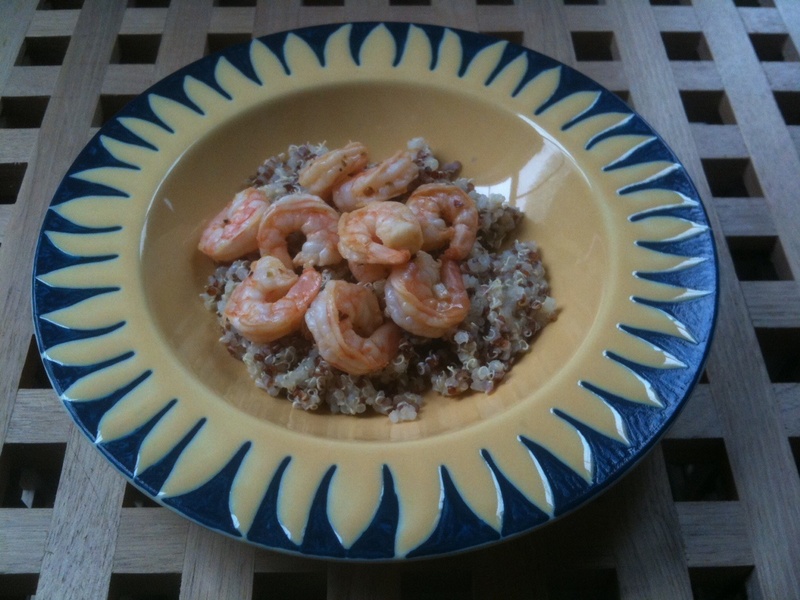 The quinoa has an intense lime flavor, and the shrimp adds a light burst of spicy orange flavor to the mix. I made a few changes to the original Citrus Quinoa recipe, so I’ve outlined my version below. The original calls for parsley, which I never have around and never seem to miss. I also made a couple of changes to the cooking process, since the original version resulted in mushy quinoa. Rinse quinoa thoroughly. Bring the water to a boil in a medium saucepan. Add the quinoa and 3/4 teaspoon salt; reduce heat and simmer until the water is absorbed, about 15 minutes. Stir in remaining ingredients. Combine juices, oil, garlic, paprika. oregano, salt and chili flakes in a large zip-top plastic bag. Add the shrimp; seal and marinate in the refrigerator for at least one hour and up to three hours. Pour about a tablespoon of olive oil into a medium skillet and add the shrimp; stir fry for two to three minutes or until shrimp are opaque. Serve over Citrus Quinoa.